1. Mix cream cheese, butter, vanilla and peanut butter until smooth. Stir in brown sugar and powdered sugar, mixing well. 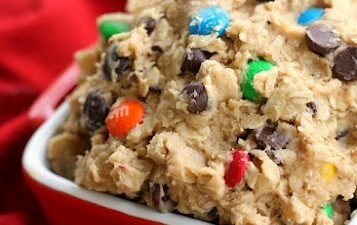 Next fold in oats, m&ms and chocolate chips. 2. Serve with pretzels or graham cracker sticks or your favorite dippers. Posted on October 12, 2012, in Lady Fab Cooks and tagged dessert, food, loaded cookie dough dip, party food, recipe, snack, sugar fairy bake shoppe. Bookmark the permalink. Leave a comment.